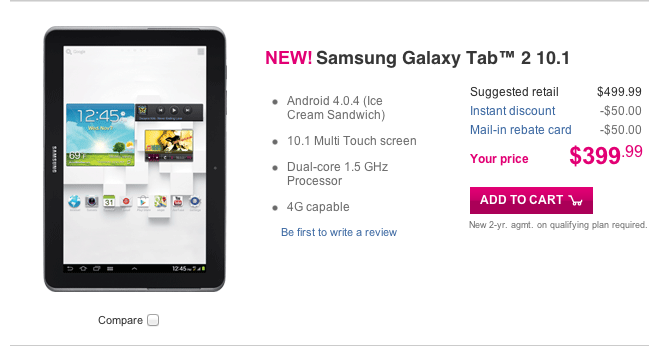 I almost lost track of the Galaxy Tab 2 10.1″ today amidst the Nexus 4 and Windows Phone 8 launches, but there it is, right on T-Mobile’s site for $399.99 after a $50 mail-in rebate. Running on T-Mobile HSPA+ 42Mbps network, the Galaxy Tab 2 10.1? is powered by a 1.5GHz dual-core processor, Android 4.0 Ice Cream Sandwich, 10.1″ 1280×800 WXGA display, 7000mAh battery, 1GB of RAM and a Jelly Bean update arriving “soon.” T-Mobile’s model arrives with 16GB of internal memory with an expandable microSD slot providing up to 48GB of memory. The “good” news is that T-Mobile’s model lacks LTE, so it runs around $100 cheaper than AT&T and Sprint alternatives. The bad news is that you have to weigh this purchase against that of the Nexus 10, which is by all account a “better” tablet on paper according to all relevant specs. Is tmo getting the nexus 10 for the holidays? Doubt it. Google will probably sell the 3G/HSDPA/WTVR version eventually directly through the Play store, just like they are now with the Nexus 7. Purchasing through T-mobile makes little sense, since they inflate the price anyway and offer no incentives over an unlocked tablet. No one wants this lol. When there are plenty of other tablets at the same cost off contract, yikes.